I AM not much for the #throwbackthursday or #flashbackfriday, I can't be that regular with my blogging, it just doesn't happen that way. I blog more in my head than here. Trust me, there's unpublished gold in this here noggin'. There's many an unpublished blog post lurking in my back history. For example, there's that handful of formative years spent in Central Queensland - Blackwater, to be exact. The years were between 1979 and 1984 - give or take - and I was aged five to 10. Of it, there are just a jumble of strange, dislocated memories, more feelings, of things like the heat and dust, of the bats that flew overhead when we drove to a holiday shack on the coast of a Friday night, of wet T-shirt comps and XXXX beer - neither of them indulged in by me, but these are all more 'snapshot' than accurate record. I remember the snake skin stuck in the bougainvillea, close to where the above-ground pool was. I remember the roller skating rink and though I loved it, it's sticky canteen and raucous, pulsating, hot tin shed, I was never, ever any good. I remember Mum's trips out to the rural baby health clinics she ran and Dad's work Christmas parties, and the time a baby got his hand stuck in the closed door of the fire truck as it went around the streets with all us kids on it and in it - and Santa in the cabin. They were the Christmases of still believing. By five I was well aware of who Santa was and the delights he could bring, or even withhold if I wasn't deemed up to scratch. At 10, I was still naively, blissfully unaware - and, somewhere in between, this photo was taken. My sister - with the ever permanent dark rings under her eyes, that I see now in her son - and I. Baskets in hand, totting notecards and paper: gifts that were a nudge, no doubt, to write Christmas thank you cards and letters interstate to distant grandparents. My sister is still a diligent writer of the post-Christmas thank you card. We're wearing our school sandals - JC sandals worn by every Central Queensland child in a colour best matching their school uniform. Ours were navy blue. Our dresses are the only anomaly and a clue, for my sister and I only, that this was unlikely to be taken on Christmas Day. Every Christmas our mother would sew a new summer dress for the occasion - the patterns matching and the fabric often the same simple, printed cotton, in differing colourways. Perhaps it was a Christmas eve photo, or one taken on that terrible trip with Santa, with that poor, broken child wailing louder than the siren. 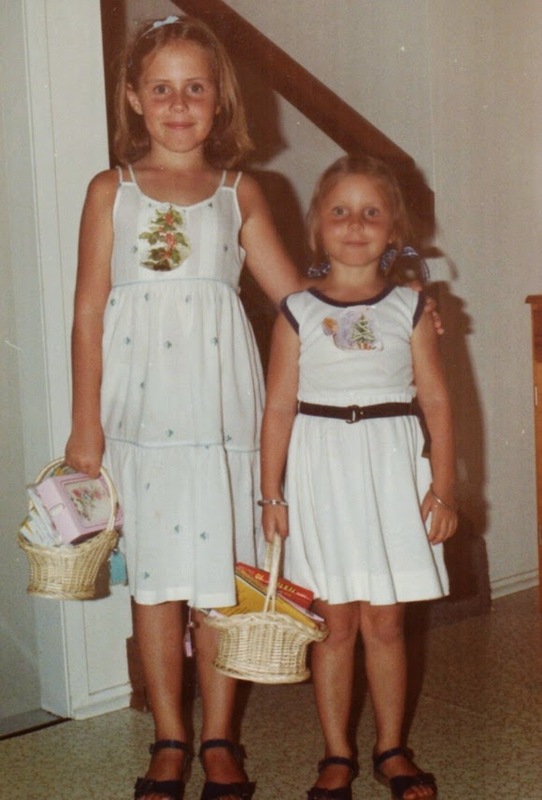 I am not entirely sure, but I look at this photo and I see all its detail - our little selves, my sister and I. I squint trying to see the people we are today. We are most definitely there, in so many small, insignificant ways; yet also, we are most definitely not. What remains most intact is what you can't see. The traditions we've carried on in both our families - baskets of trinkets, homemade dresses, santa sacks, cutout Christmas cards from the year prior, Christmas baking and all the special effort my parents went to at this special time of year that we repeat for our own. Get cracking, it's November 25 peeps. You've got a month. Thanks Jane. These memories can slip around can't they. I looked again at this photo and was better able to date it. My sister isn't wearing glasses and her funny vacant stare was a telltale sign. She wore glasses from the age of four, so she's probably three, maybe four in this photo. That makes me six, maybe seven. Small, personal details, right. you have some amazing memory snapshots! Brag all you like. I am well on my way to having this whole Christmas things wrapped. Boom-tish. Gorgeous! We had very similar strappy dresses for Christmas. Hope all is well up your way.